Kirkland Cemetery, Montgomery County, IL, U.S.A.
Kirkland Cemetery is located in Montgomery County, IL, just north of the Montgomery County-Bond County line. The nearest town, Sorento, is located in Bond County, IL, just south of the Montgomery County-Bond County line. 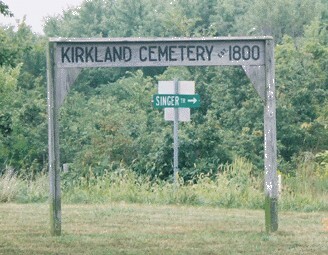 Because Sorento is located in Bond County, some sources have erroneously concluded that Kirkland Cemetery is also located in Bond County.